All Versions - Compatible with patch 1.51.75, No Updates Needed! To see the status of all my mods, you can always check the status posts on my Tumblr. ♦ RequiredRecipeIngredients - Requires ingredients for all recipes, good if you want the game to be more realistic. After all, you can't cook a fish dinner IRL without the fish, right? Includes ALL recipes that has ingredients (including recipes from City Living, Jungle Adventures, Cats & Dogs, and Seasons). Great to use with NoIngredientRecipesHIDDEN or NoIngredientRecipesHIDDEN_PLUS! 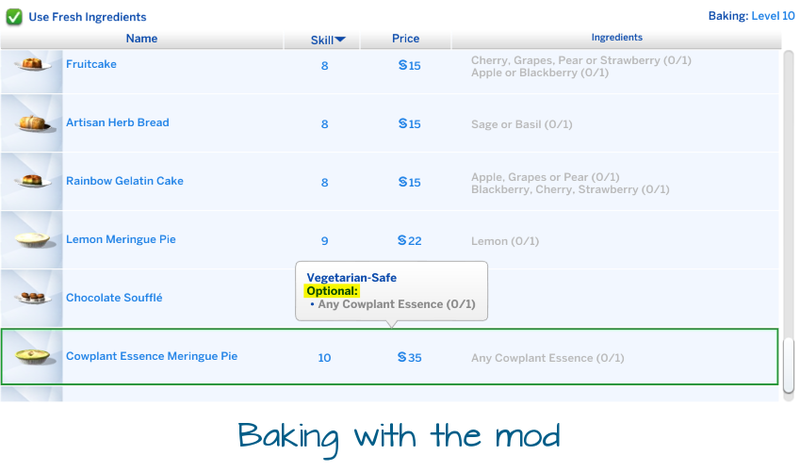 ♦ NoRequiredIngredientsFOOD - Removes the ingredient requirement for Homestyle, Gourmet, Baking, Campfire, and Cupcake Machine recipes. Additionally, the Bee Tea recipe that came with Seasons. ♦ NoRequiredIngredientsHERBALISM - Removes the ingredient requirement for Herbalism Potions. ♦ NoRequiredIngredientsSERUMS - Removes the ingredient requirement for Serums. 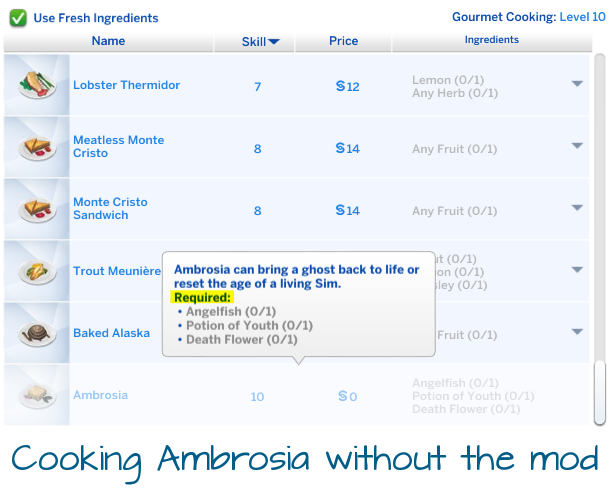 ♦ NoRequiredIngredientsVAMPIRES - Removes the ingredient requirement for Plasma Fruit Salad, as well as the Vampire Drinks made at the bar (Draught of Reconfiguration, Plasma Jane, Shadow Realm, Sunlight Reversal Cocktail, The Ultimate Vampire Cure, and Vampire Resistance Cocktail). ♦ NoRequiredItemsINVENTION - Removes the item requirement for the Invention Constructor recipes (Alien Portal, Cloning Machine, Satellite Dish, and SimRay). ♦ NoIngredientRecipesHIDDEN - Hides recipes that doesn't have ingredients. 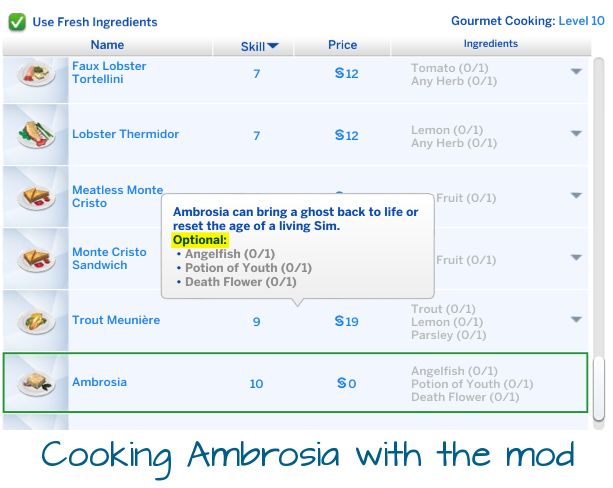 Sims will still be able to autonomously cook them, you just can't see them when you instruct your Sim to cook. This includes Baking, Homestyle, Gourmet, Grill, and Campfire recipes. Does NOT include Experiemental and Cultural recipes. Best used with RequiredRecipeIngredients version. Do NOT install with NoIngredientRecipesHIDDEN_PLUS! ♦ NoIngredientRecipesHIDDEN_PLUS - Same as NoIngredientRecipesHIDDEN plus Marshmallows from the Campfire and Quick Meals from the Cooler also hidden. Do NOT install with NoIngredientRecipesHIDDEN! 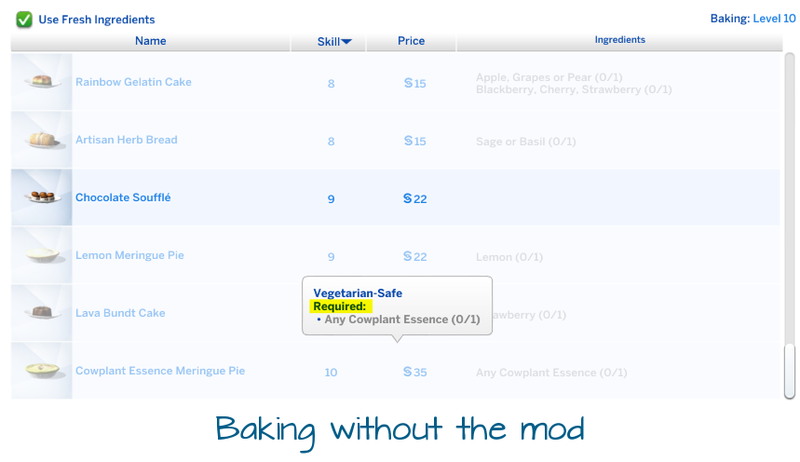 Not compatible with any other mod that alters recipes. If you're having issues with this mod, please confirm that this mod isn't conflicting with another mod in your Mods folder before reporting it. 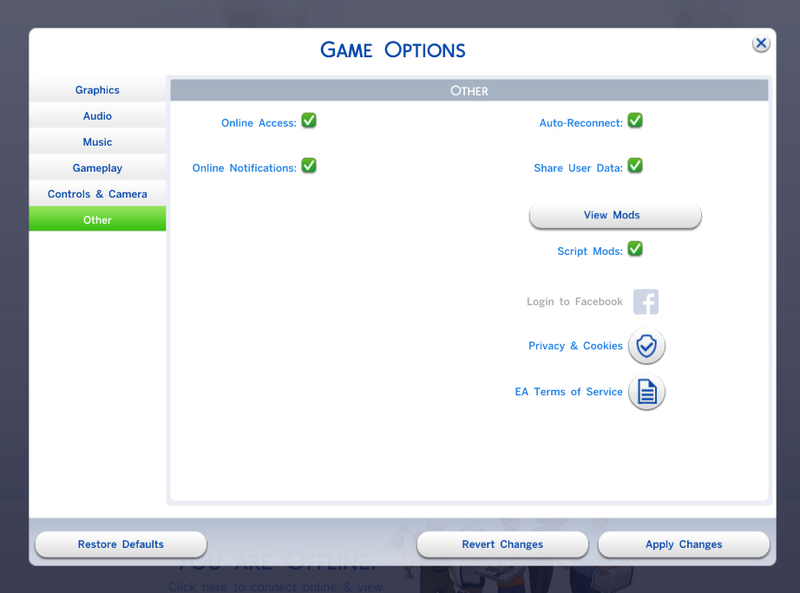 You can do this by testing this mod ALONE in the mods folder or using TS4 Package Conflict Detector by scumbumbo. 2/21/19 - Updated NoIngredientRecipesHIDDEN_PLUS for 1.50.67. 1/22/19 - Added requested NoIngredientRecipesHIDDEN and NoIngredientRecipesHIDDEN_PLUS options. 1/20/19 - RequiredRecipeIngredients updated to add Crown Roast and Strawberry Cake recipes. 11/24/18 - Added requested NoRequiredItemsINVENTION version. NoRequiredIngredientsFOOD.zip | Description: Removes the ingredient requirement for Food Recipes - Homestyle, Gourmet, Baking, etc. NoRequiredIngredientsHERBALISM.zip | Description: Outdoor Retreat Needed - Removes the ingredient requirement for Herbalism Potions. NoRequiredIngredientsSERUMS.zip | Description: Get to Work Needed - Removes the ingredient requirement for Serums. RequiredRecipeIngredients.zip | Description: Requires ingredients for all recipes. Scarlet_NoIngredientRecipesHIDDEN.zip | Description: Hides recipes that does not have ingredients. NOT compatible with NoIngredientRecipesHIDDEN_PLUS! Scarlet_NoIngredientRecipesHIDDEN_Plus.zip | Description: Same as NoIngredientRecipesHIDDEN plus Marshmallows from the Campfire and Quick Meals from the Cooler also hidden. NOT compatible with NoIngredientRecipesHIDDEN!